The region's latest park and ride site has officially opened. 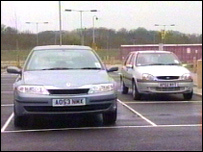 The Thickthorn service provides nearly 800 parking spaces and is located just off the A11 in Norfolk. Opening ceremonies are also being held on Tuesday for the new link road up to the Norfolk and Norwich Hospital and the Norwich Research Park. With the opening of the Thickthorn service, Norwich now has the highest number of permanent park and ride sites in the UK, with almost 5,000 spaces. It has cost about £3.65m to build and is being opened to ease congestion in the city.